The new Bride CD "Snake Eyes" will feature Alexandre Aposan on drums, Nenel Lucena on bass guitar, Troy Thompson on Guitar and Dale Thompson as singer. Dale claims that the new album will have the sound of Bride in the 90s and that they will not experiment with any new sounds. “This is a labor of love, and we are happy and honored that we have been called out of retirement by the Lord to take on this task. In order for us to produce this new CD, we are asking for your help with contributions, which all go toward the cost or recording, mixing and mastering this project. In December 2013, vocalist and leader of Bride, Dale Thompson, announced that the band was coming to the end with the release of their latest album"Incorruptible" without a farewell tour. Dale Thompson moved to New Zealand, where he has been living until now, and in 2014 married Adelinde Thompson. Dale has refused to be away from music, in 2015 announced his return to music with a new band called "The World Will Burn", has released 2 albums since then, and they have never performed live, as it has been a studio music project with Allan Zaring, who lives in the United States. Troy Thompson continues to live in Louisville, Kentucky and played guitars on the second album of The World Will Burn, Ruination. Dale Thompson's musical activity increased since 2017, when he began working with another musical project called N.O.G. (No other God) with musicians from Brazil. In early 2018, Dale announced that he was working with Tiago James de Souza on a new music project called Perpetual Paranoia. Dale's musical activity has been having since then indicated that his iconic band Bride could return at any moment. It was only a matter of time before it was officially announced that the four-time Dove award-winning band would return to the music scene. Since November 2017, Dale has been reporting on his facebook account about the process of recording and producing of the new album. In one of his most recent updates, Dale gives us the first preview of the song"John the Baptist". This song is not yet mixed or mastered and these are not the real drums... but it gives you the taste of things to come. 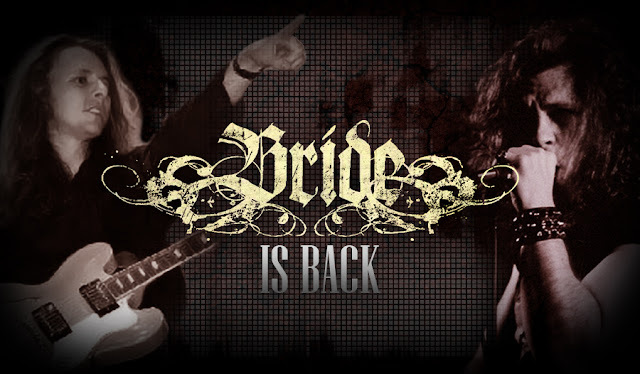 Bride, formed by the Thompson brothers in the early 80s, started with the name of matrix, to change it to Bride in 1986, releasing twelve studio albums and becoming one of the most important Christian metal bands of all time along with Stryper, Bloodgood, Whitecross or Barren Cross. Snake Eyes will become the album that saw the band return along with musicians from their beloved nation of Brazil.